Congratulations Burton Award Winners from Pitney Bowes Management Services, a leader in mail and integrated document management services. The Burton Award is the "Pulitzer" of legal writing. Since 1999, this unique national awards program has honored effective legal writing. Awards are given to law firms and law school students who use plain, clear and concise language and avoid archaic, stilted legalese. 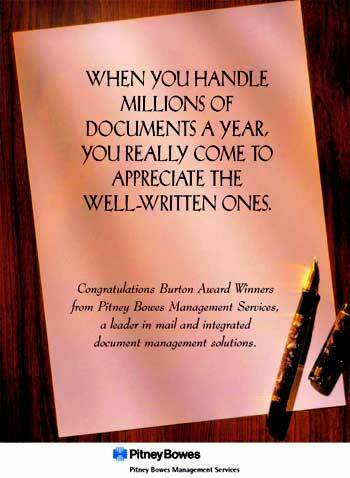 Pitney Bowes is a document management leader. This ad was done for a Burton Awards program several years ago.